A stunned Ellen Foley thanks Rachel Rasmussen of the Business Forum for her nomination. 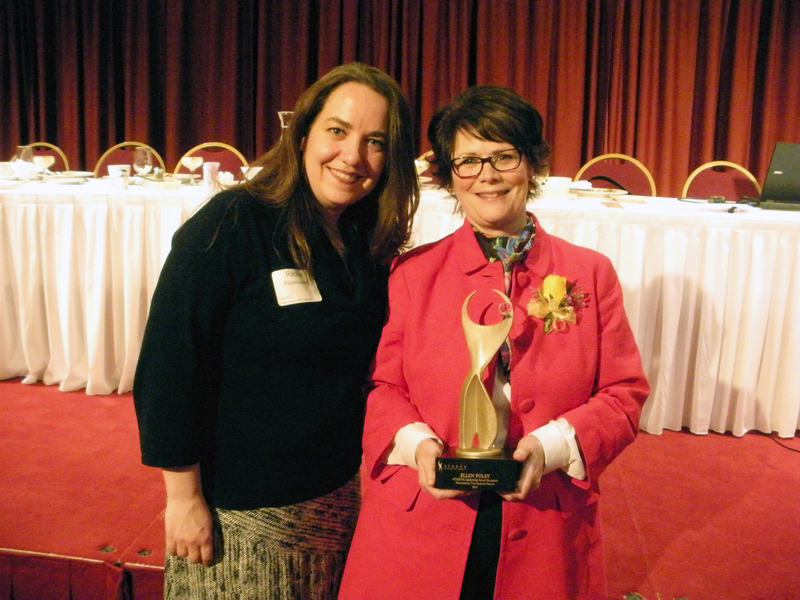 Ellen Foley, role model for many and an advocate for women to become great leaders, was honored Tuesday night with the ATHENA Award from The Business Forum in Madison before a crowd of more than 200 people at the Monona Terrace Convention Center. As Senior Vice President of Corporate Communications at WPS, Ellen has had a career rooted in journalism, strategic communications, marketing, and community involvement. But her role as friend and mentor is what really gives her the most reward. Ellen and the other nine nominees were honored for demonstrating excellence and initiative in their careers, community involvement, and support of women. The international awards program seeks to inspire others to achieve excellence in their professional and personal lives. The Business Forum has helped its more than 80 members build their careers through networking and service for 27 years. It has presented the ATHENA Award for 18 of those years. Previous recipients include longtime community leader Carol Toussaint as well as Laurie Benson, founder of Inacom Information Systems, now called Core BTS. Ellen was nominated by Rachel Rasmussen, president of Rescue Desk, who has benefited from Ellen’s mentorship over the years. In her acceptance remarks, Ellen said she was humbled and honored to be in the same room as the other nominees, all of whom she said are winners. And then she spoke of the mentoring role that is so important to her. In her nomination, Rachel summarized Ellen’s professional career but accented Ellen’s ability to make so many people feel important and respected. “One look at Ellen Foley’s resume, and it’s undeniable that her career has centered around leadership, creativity, and initiative,” Rachel wrote. “Her success is rooted in both her natural brilliance as well as her infectious energy, and she approaches all of her professional endeavors with intelligence, grace, humor, and unwavering determination. Rachel noted that Ellen led the campaign for the successful $134 million referendum at Madison Area Technical College and started her own business as a communications consultant. Rachel also pointed out Ellen’s crusade to protect women from violence. In addition to WPS colleagues and other friends, Ellen was joined at the award dinner by her husband, Tom, who is a cancer survivor. Ellen shared that journey on a blog that had 138,000 visitors.